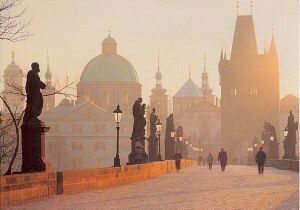 The Charles Bridge is a famous historic bridge that crosses the Vltava river in Prague, Czech Republic. Its construction started in 1357 under the auspices of King Charles IV, and finished in the beginning of the 15th century. As the only means of crossing the river Vltava (Moldau) until 1841, the Charles Bridge was the most important connection between Prague Castle and the city's Old Town and adjacent areas. This "solid-land" connection made Prague important as a trade route between Eastern and Western Europe. The bridge was originally called the Stone Bridge (Kamenný most) or the Prague Bridge (Pražský most) but has been the "Charles Bridge" since 1870.